Tuffy Lieutenant Splock is a tough super fun floating fetch toy. 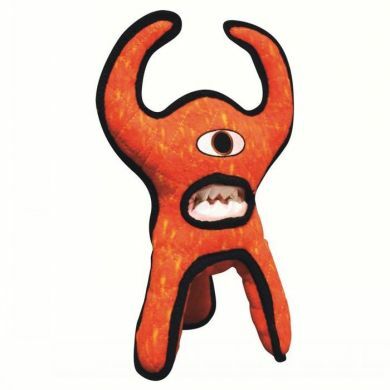 This fiery cyclops alien wants to be your dog's best mate. Take Lieutenant Splock on some adventures. 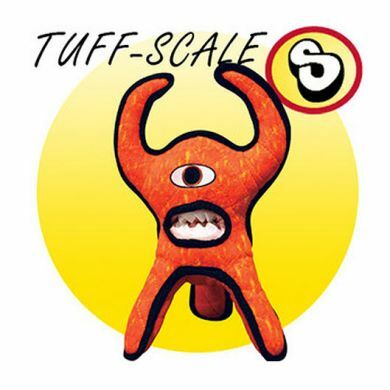 Tuffy Toys are known for their strength and this one is an 8/10 on the Tuff Scale and a 10/10 for fun. The size of this friendly outer space creature is 33 x 23 x 18cm. What's great about the Lieutenant Splock? He's strikingly good looking. Let's face it. Tuffy Pet Toys are known as the most durable soft toys available. The fact that all the layers of this toy are bonded and sewn together make this toy super tough. Each seam is sewn multiple times for extra strength. Generally other toys on the market only have one seam to hold the toy together. Webbing is then sewn around the edges of the toy and then these edges are stitched together to make each toy Tuff. And the squeakers are sewn into secure pouches as an added layer of safety. Read 2 customer reviews of Tuffy Toys Lieutenant Splock. The average customer rating is 2. We had high hopes but poor Lieutenant Splock only lasted 45 minutes with our Staffie pup of 10 months... every inch of stuffing was ripped out of his mouth while we opened Christmas presents! I think he might be more suitable for less determined chewers. Our Koolie cross pup loved this toy, as there were so many different angles for her to grip and throw it. Unfortunately the weak spot of the toy was the mouth and the teeth, where she was able to start pulling him to pieces. And then I left them unsupervised together and alas, Lieutenant Splock didn't make it. But he was very loved while he lasted. I've learned my lesson: no matter how tempting, I can only buy super tough chewer rated toys. If you have an ordinary dog, they'll love this!